Recover Damages For Wrongful Death of Family Member. 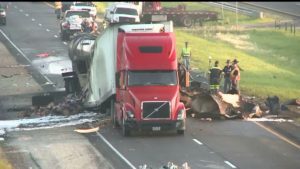 The tragic death of a family member resulting from the negligence of another person (such as an over-tired semi-truck driver ), triggers a claim under the Illinois Wrongful Death Act. 740 ILCS 180/1. The Act allows a person to pursue a claim for the benefit of the surviving spouse and next-of-kin (family members) for their “pecuniary injuries.” In other words, the Wrongful Death Act allows for the recovery of money damages by the decedent’s surviving spouse and/or next of kin when a wrongful act causes a person’s death. Not surprisingly, the money damages recoverable in a wrongful death case can be significant. For example, the death of a spouse, especially a bread winner, can have devastating economic consequences on a family. But even the loss of an elderly family member can warrant a significant damage award under the Wrongful Death Act. In fact, where the decedent leaves direct lineal kin, or a widow or widower, there is a presumption under the law that they have suffered substantial pecuniary loss by reason of the death. Ferraro v. Augustine, 45 Ill. App. 2d 295 (1st Dist. 1964); Hall v. Gillins, 13 Ill.2d 26 (1958). This presumption of substantial damages applies even where the decedent was an adult and the next of kin are also adults. Recently, the trial attorneys at DeBlasio & Gower law firm recovered substantial damages under the Wrongful Death Act for 10 half-siblings of a young woman who was tragically shot by an off-duty Chicago police officer. DeBlasio & Gower also recently obtained substantial damages Wrongful Death Act for the children of an elderly woman who suffered a massive brain bleed after she was left unattended at a rehab hospital and hit her head on the hard floor in her room. Under the Wrongful Death Act, the term “pecuniary injuries” has been interpreted to include benefits of a pecuniary value, which includes money, goods, and services received by the next of kin of the deceased. When there are surviving children, it also includes the instruction, moral training, and superintendence of education that the children would have received from the deceased parent. “Pecuniary injuries” has also been held to include the loss of consortium by the surviving spouse (e.g., the society, guidance, companionship, felicity, and sexual relations with the spouse) Elliott v. Willis, 92 Ill.2d 530, (1982); the loss of a minor child’s society by the parents, Bullard v. Barnes, 102 Ill.2d 505 (1984); the loss of an unmarried adult child’s society by the parents, Prendergast v. Cox, 128 Ill. App. 3d 84 (1st Dist. 1984); the loss of a parent’s society by an adult child, In re Estate of Keeling, 133 Ill. App. 3d 226 (3d Dist. 1985); and the proven loss of a sibling’s society, In re Estate of Finley, 151 Ill.2d 95 (1992). For a consultation in a wrongful death case, call the trial lawyers at DeBlasio & Gower at (630) 560-1123 or contact us via our website http://www.dgllc.net/contact. Our attorneys have the experience to face the most difficult challenges in court, including the Circuit Court of Cook County, the DuPage County Circuit Court in Wheaton and the Will County Circuit Court in Joliet. www.DGLLC.net.